Wouldn't you like to learn some Japanese? As for all the cliparts, use fee is FREE ! Main exhibition; Animal, Bird, Creature, Plant, Cook, Wallpaper ... and more! Are you looking for something? Or just a stroll? If you stroll with nothing to do, how about TOUR of the Happa's HAKUBUTSUKAN? TOUR is an unlost way for seeing all pictures in a section. Click icon of each page, that's taking a TOUR! If you are troubled with too small window to look the graphics, use "NOFRAMES" pages. The anchor point to open the "NOFRAME" page is located in bottom of the contents frame on left side of each section. * These anchor points are examples, not active. Or use "section entrance" at the bottom of each page. Do you know the meaning of "Happa's HAKUBUTSUKAN"? It means "Happa's museum", and then, "HAPPA" is meaning of "foliage leaf" (that's like my lips! ), in Japanese. I'm Japanese. And I'm hoping many people of the world will experience something of Japan. So I try that the entry word is equipped with the equivalent of word in Japanese. # In case of business use, contact to me (katz@happa.net). 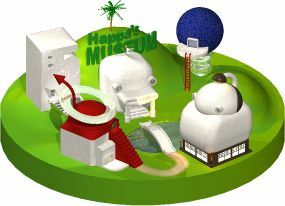 The copyright of this site and all contents are reserved by Katz/Happa's HAKUBUTSUKAN. ANY UNAUTHORIZED ALTERATION OF ANY OF ITS CONTENT IS PROHIBITED. Please read the guidelines table as follows. e.g. You write : "This site is MY art gallery." You can use all of Happa's cliparts free on your personal webpages, but please, DO NOT LINK (<IMG src=... ) DIRECTRY to the graphics file FROM HAPPA.NET. I wish to that you will do download graphics file into your computer first. And then, upload to your web server. Happa's HAKUBUTSUKAN cliparts are not link-ware. Plz feel free to use. If you would link to this site Happa's HAKUBUTSUKAN, and if your webpage is FRAMEed, add the target attribute target="_top" or target="_blank" to <A> tag. Do you need the banner image? Here those are!